Technology is awesome. Things that couldn’t have even been imagined 100 years ago are just another part of daily life in 2015. You can have a face to face video conversation with someone on the other side of the world, use a system of satellites to navigate through the back country, and write a nearly limitless amount of words on a computer, but sometimes things just go wrong. The battery dies, the screen cracks, you drop the device in water, or for whatever reason you can’t access the information you need. 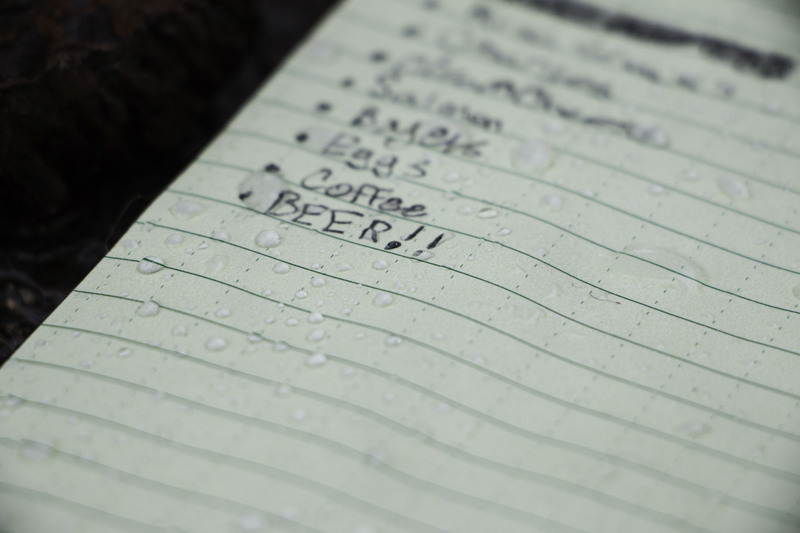 It is situations like this that have led our team to always carry hard copy maps, documents, and note pads along with us. 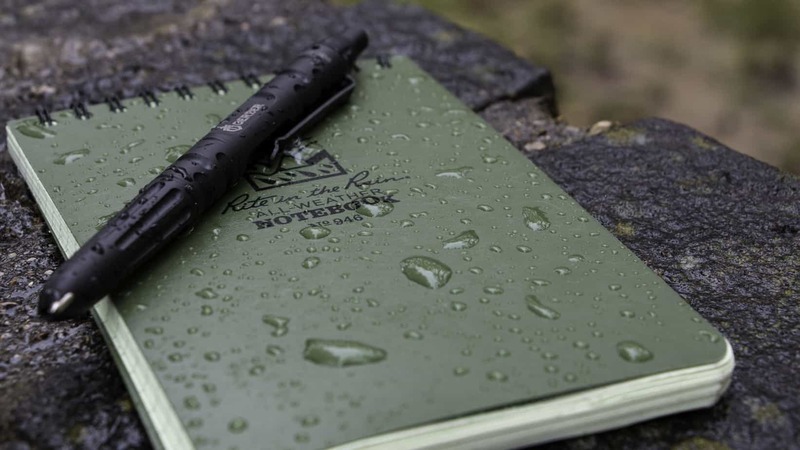 Paper backups and writing utensils can range from the cheap to the extravagant, but we decided to look in the middle of the road at Rite in the Rain’s weather proof notebooks. They have been very popular in recent years and we were curious to see if they were really as great as people claimed. 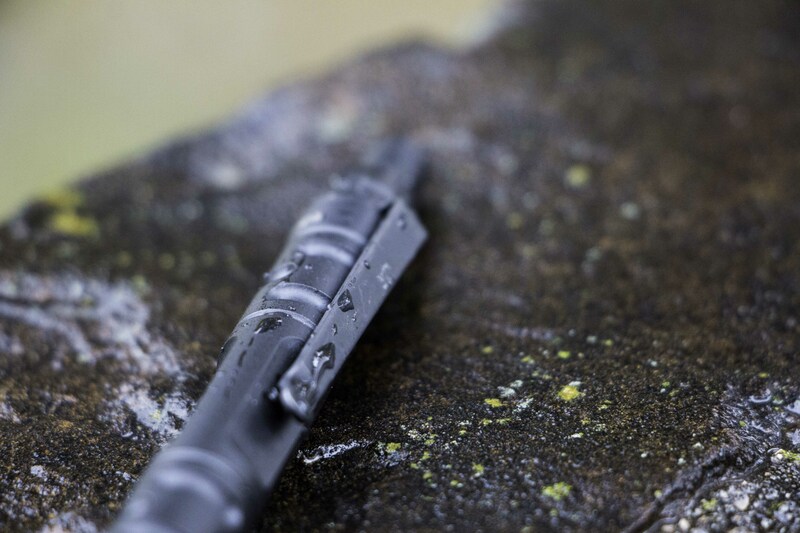 For proper testing we selected a Rite in the Rain approved pen to go along with them, the Gerber Impromptu. If you’re anything like me, you have probably mumbled your fair share of curse words while fervently scratching a cheap plastic pen on paper. You’ve probably also hurled one at a trash can in anger after several minutes of destroying your document without the slightest hint of ink. It was in the midst of one of these fits of rage that I bit the bullet and ordered this Gerber pen. The Impromptu began as a project between Gerber and law enforcement professionals to improve safety in the field. The results of many interviews concluded that the tool with the most impact in keeping an officer safe, was whatever happened to be in their hand when a situation occurred. In the daily routine of Police, this usually meant a pen. The first thing anyone notices when they pick this thing up is its heft. 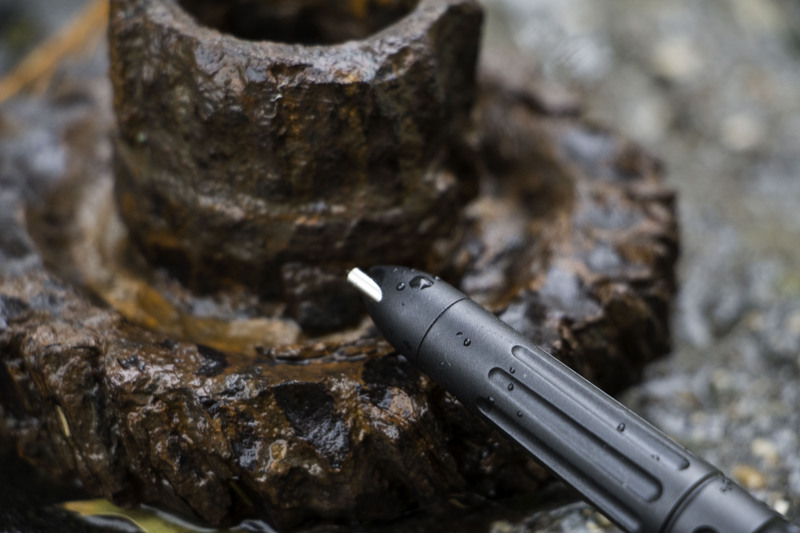 The machined steel construction and impact resistant components weigh in at 29 grams, five times as much as your standard plastic Bic. It gives the product a feeling of quality when you write, and also instills confidence that you could indeed use it to defend yourself if the situation arose. We’re not suggesting you charge into battle wielding your Gerber as a sword, merely that it could be a subtle yet effective tool while traveling abroad. The push-button top feels sturdy and doesn’t wobble or creak after repeated use, and the pocket clip hasn’t weakened or snapped like every pen I’ve used before. One of the big “tactical” points of this pen, no pun intended, is the glass breaking tip incorporated into the end. We liked that they made it a solid fixture and not something you extend, though it does make it possible to catch the point on your paper. Ah but this is a pen you say, how does it write? 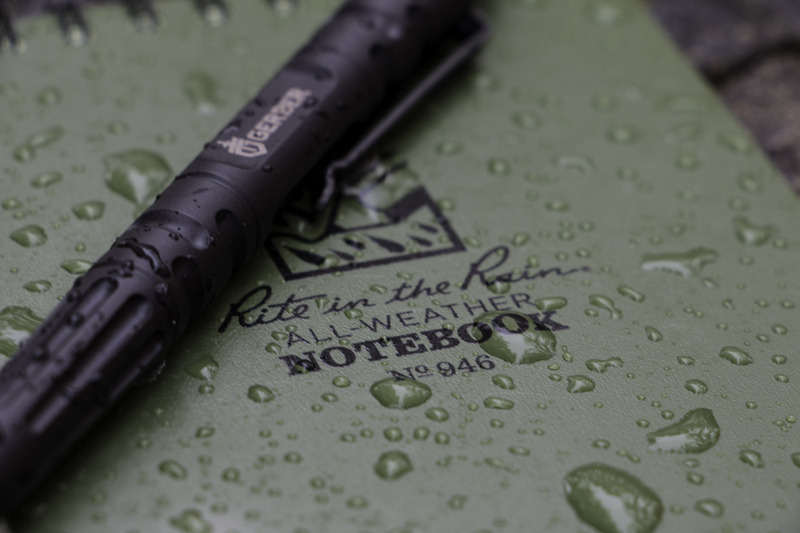 I find the “Rite in the Rain” ballpoint tip writes a lot like a land-cruiser drives. 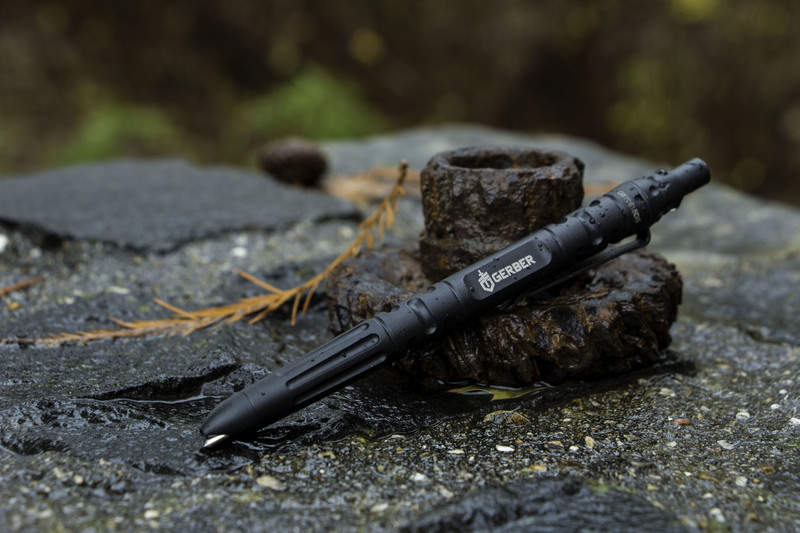 There are definitely smoother and more graceful options out there, but this pen continues writing every single time regardless of weather conditions. It has never required me to scribble on the paper in hopes of getting ink to flow again, or shake it violently while others in the office watch on in horror. It does exactly what a pen should do, it writes. 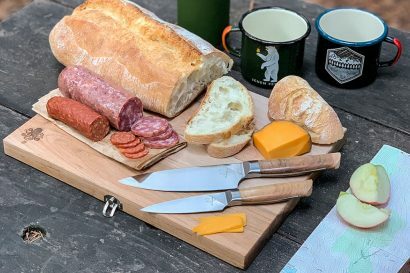 The American made Impromptu lists for a heart stopping $72 on Gerber’s website, but it can be found on Amazon for a more reasonable $34.49. Yes it is still pricey, but I have found it to be worth every penny in saved frustrations, thrown away plastic pens, and my renewed joy in writing. 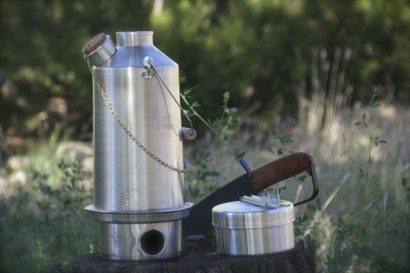 Check it out here, along with other great products from Gerber. In most regards this notebook is exactly what you would expect. It has an attractive green polydura cover on the front and rear, is spiral bound at the top for easy flipping and page removal, and it happens to be the size of a 3×5 card. The paper itself is horizontally lined for writing, but also includes lightly colored vertical dashes for graphing if needed. 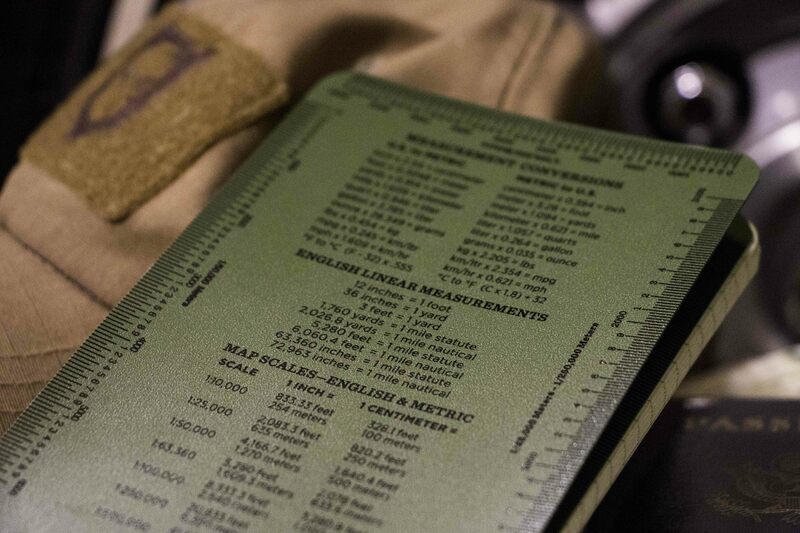 What sets it apart and makes it a perfect travel notepad though, are the little details incorporated throughout. The first thing you’ll see when opening the front cover is a great big list of very useful information. This includes things like chart measuring tools and scales, tons of standard to metric conversions including speeds, distances, lengths, volumes, temperatures, and weights, and even combinations of conversions like miles per gallon to kilometers per liter! The back cover is bordered by two rulers running the length of the card, one for centimeters and one for Inches. 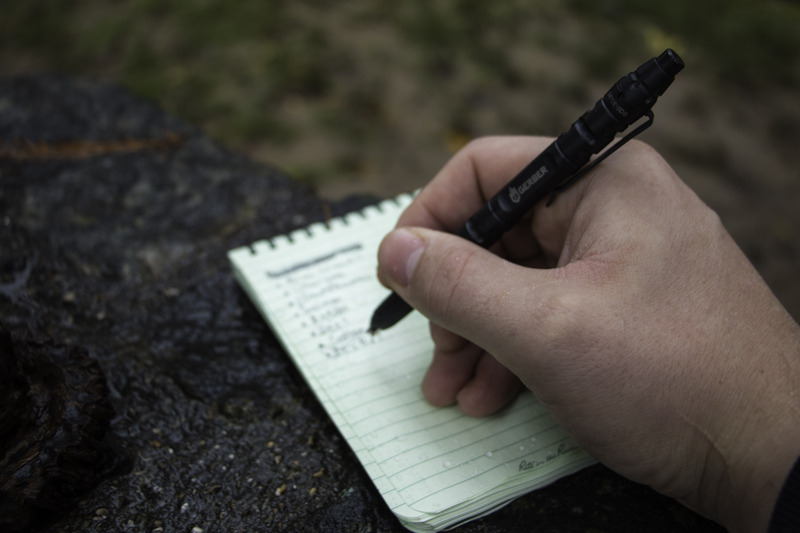 Besides a slight waxy feel, you would never know that you weren’t writing on standard paper until things got wet. 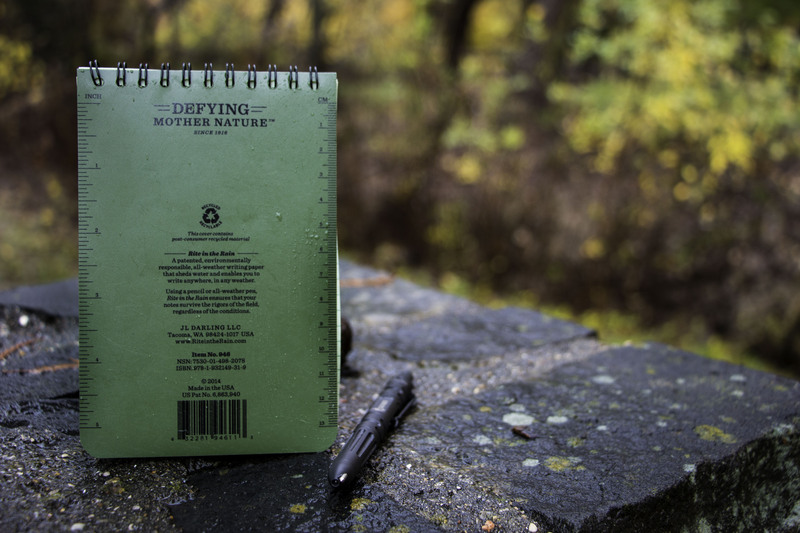 For our test I took the Gerber Impromptu and notebook out on a cold rainy day and let water cover everything. The rain quickly beaded off the paper and fell to the ground, so I increased the challenge a little by laying the pad down and allowing the moisture to accumulate. After ten minutes I looked at some text I had scrawled out earlier and found it remained poorly written, but otherwise perfect. I then began writing new words to see how the pen would react with the damp paper. To my surprise the ink didn’t bleed away from the letters and everything appeared normal, so I tried a little harder. I placed the ballpoint directly inside a water droplet and scribbled a word down. This finally achieved some ink dispersal, but the letters were still clearly legible. Since the book isn’t 100% waterproof, the first few pages began to ripple near the end of our test as I had expected. What I hadn’t expected, was the complete lack of fading, discoloration, or weakening of the paper, even after extended deliberate abuse. For $14 per three pack on Amazon, I feel these little notepads are well worth the money. They’re great to have when traveling, as well as a cool way to show off your love of the outdoors around the office. 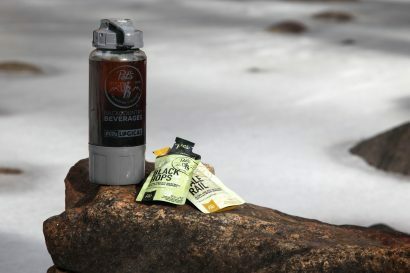 Be sure to check them out, along with Rite in the Rain’s other great products here. The Rebelle Rally announces women's navigational event!